The fine-grade BLACKFIRE Poly Clay Bar creates the perfect foundation for a head-turning shine. This advanced synthetic clay bar removes the embedded paint contamination that car washing cannot, without scratching or dulling the most delicate paint finishes. Fine-grade BLACKFIRE Poly Clay works on all paint finishes, including clear coats. It is easy to work with and leaves almost no residue on the surface of the vehicle. Fine-grade BLACKFIRE Poly Clay does not dry out with age and does not decompose with repeated applications. Fine-grade BLACKFIRE Poly Clay I leaves auto paint feeling slick, clean, and silky. Fine-grade BLACKFIRE Poly Clay removes what day to day driving puts into your vehicle’s paint. If you drive your car, it is going to collect paint contamination. There is no wax or paint sealant that can fully protect against contamination from rail dust, brake dust and environmental fallout. Most paint contamination consists of tiny metallic particles from brake pad linings and rail dust created from the friction of train wheels against railroad tracks. These hot metallic particles fill the air on highways and near railroad tracks where they ultimately land on your car's finish, burning through any wax or sealant coating and embedding themselves in the top paint or clear coat layer. Contaminants can be felt as a "rough or gritty" texture on the paint's finish. Fine-grade BLACKFIRE Poly Clay is the latest in gentle-cleaning clay technology. It is the most recent innovation of the original detailing clay bars developed in Japan in the 1990s. It works by pulling contamination off the surface. It is not abrasive and does not remove the top paint layer. Only detailing clay can make your vehicle feel silky smooth without polishing. Use fine-grade BLACKFIRE Poly Clay twice a year to enjoy the slickness and shine that comes from being truly clean. Two 100 g. bars of fine-grade Poly Clay will clean up to 20 cars. BLACKFIRE offers two versions of Poly Clay. First is the gray-colored PolyClay II, designed to remove moderate to heavy paint contamination quickly. Second is the green-colored Poly Clay – Fine Grade. This clay is ideal for light and maintenance cleaning and reduces the chance of inflicting surface marks on soft paints. For best results using BLACKFIRE Poly Clay – Fine Grade, mist a small area (2 sq. 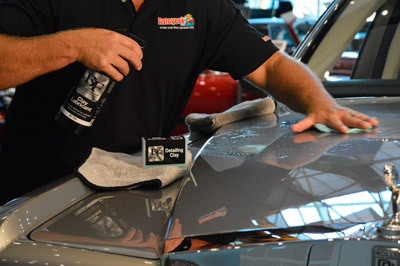 ft.) of the vehicle with BLACKFIRE Clay Lubricant and rub the clay bar over the surface. The clay will "grab" at first. Continue lightly rubbing the clay over the surface until it moves freely. When the bar moves freely, the surface is clean. Wipe off any residues with a microfiber towel and proceed to the next area. If clay residues resist easy wipe-off, re-mist the cleaned area with Clay Lubricant and wipe with a clean microfiber towel. Even stubborn residues will wipe off easily.